Logwood, Alkanet and False Alkanet are the principal blue dyes apart from woad and indigo. The tree comes from Mexico and Belize in Central America and the wood chips produce violet, purple, black and grey colours. Read more about dyeing with logwood here. 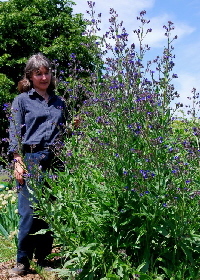 This plant is also known as Common Bugloss or Common Anchusa and is a perennial plant of the Borage family like true Alkanet. It grows to nearly two metres tall, is very hairy, and has beautiful deep blue flowers . The roots produce a purple dye, but they do not yield anywhere near as much dye as the true alkanet. I am still waiting for my plant to spread, so that I can dig up some roots to try it out.